Catholic schools are a mission for all, Cardinal O'Malley says. Published 2/2/2018. Local. BRAINTREE -- All Catholics need to identify with the mission of Catholic schools, according to Cardinal Seán P. O'Malley. Speaking with Kathy Mears, superintendent for Boston Catholic Schools, on her office's podcast, Cardinal O'Malley said that educating youth through Catholic schools is one of the Church's largest, most successful missions. "There is no other institution that has moved people out of poverty the way that the Catholic schools have done," he said. "All Catholics, whether they have children who are school age or not, need to identify with this very important mission." The Archdiocese of Boston's Catholic Schools Office began the podcast, "Saints and Scholars On-the-Go," in December 2016. They seek to address topics that involve education, faith and daily life as well as connect with the parents of Catholic school students. 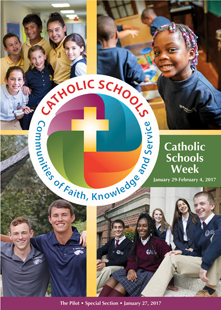 The most recent episode, featuring Cardinal O'Malley, marks Catholic Schools Week and can be found online at csoboston.com/podcasts. The cardinal recalled fondly his own memories of Catholic school. He attended Catholic schools all the way through graduate school, which was also the first time he had a lay teacher. "Our schools were very blessed by the presence of so many men and women religious who dedicated their lives to teaching other people's children and doing it well," he said, adding that they also modeled a life of discipleship. Cardinal O'Malley thanked God for the lay men and women who have taken up the mantel of Catholic education. These dedicated educators serve the Church, making sacrifices that benefit the next generation. He also praised parishes that have made great sacrifices to support Catholic schools and urged all parishes to make the sacrifices needed to help their local schools flourish. The cardinal said that Catholic schools benefit their students and, by extension, the Church as a whole. The schools prepare young people for a life of faith and to be productive citizens. Graduates are more likely to be active, committed Catholics who give back to their Church and community. They are also more likely to be volunteers and give more to charity, he said. Data from the Center for Applied Research in the Apostolate (CARA), which conducts social science research at Georgetown University in Washington, D.C., indicates that Catholic school graduates are more civically engaged than their public school counterparts. When speaking about the future of Catholic schools, Cardinal O'Malley said he hopes to see schools deepen their Catholic identity, stand on firm financial foundations and become even more accessible to all children, particularly immigrants and those who are poor. "Obviously, many parents feel the economic pressure of not being able to afford Catholic education," he said, adding that he is in favor of school vouchers or tax credits that allot money to families who opt out of public schools in favor of parochial schools. That allotment allows parents to have a real choice in education and saves the government money since Catholic schools spend less than public schools to educate each student. "People have to see that the Catholic schools are not in competition with the public school," he said. At the end of the podcast, Cardinal O'Malley addressed the Latino population in Spanish. He encouraged them to consider Catholic schools and universities where their children will be prepared to succeed in life while receiving good Christian formation. For anyone with financial concerns, he said that there are programs to help with the cost and that the value of a Catholic education is immeasurable.